This little lesson module is about subject verb agreement, one of the most common error types on the test. So it's really important for you to know. 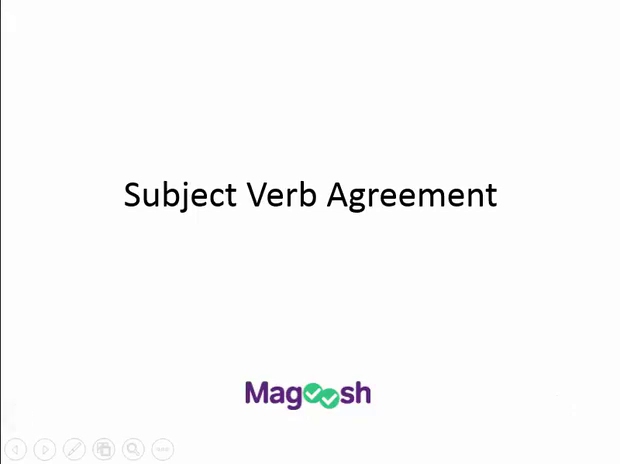 And there are a couple important tips I can give you about subject verb agreement issues on the test. The first is that the subject may not appear directly in front of the verb. If you said, the boy run down the street, that is too easy to spot. It should be, the boy runs down the street, and most students will see this right away. So the test makes it harder on you by putting a bunch of stuff in front of the verb. So if the subject is actually singular, it will throw a bunch of plural nouns between the actual subject and the verb or vice versa, if it's plural, put a bunch of singular nouns in between it. So your ear loses track of what the subject was. So let's take a look at these examples. Let's start super easy. Here's an example you're not likely to see on the test because it's too easy. But it might be on a really easy question. The exam is truly daunting, or the exam are truly daunting. Well this is singular, so it should be is. Now, let's up the difficulty level a little bit. What's the subject here? The topics on the exam is/are truly daunting. Well now, it's not exam, it's topics. The topics are daunting. So it should be the topics are truly daunting. Now, note we have this prepositional phrase here. And that's really important to notice because prepositional phrases can include those other nouns. So if you've got prepositional phrases in front of your verb, you want to make sure you go back before them to find your subject. Here is a even more difficult answer, now we've added even more stuff. The exam which cover/covers everything from Plato to plutonium is/are daunting. Okay, so we have this long subordinate clause set off with commas here, and when we set off part of the sentence in commas like this, it means we should be able to pull it out of the sentence and it should still make sense. So let's deal with the main part of the sentence first. The exam is/are daunting. The exam is daunting. That is still our subject, and cover/covers, well, that refers to exam as well too, so it should be the exam covers everything from Plato to plutonium is daunting. Now let's make it even trickier. Now we have two phrases getting in the way. The topics on the exam, which cover/covers everything from Plato to plutonium, is/are daunting. Okay, so we have this prepositional phrase here, and we have that subordinate clause set off with commas, so let's get rid of all of that and we have the topics are daunting, so topics is now our subject. The topics on the exam cover everything from Plato to plutonium. So now we need the plural verbs. All right, more phrases getting in the way. The range of topics on the exam which cover/covers everything from Plato to plutonium, is/are daunting. Let's get rid of our subordinate phrase there, set off by commas, first. And we have a prepositional phrase here that we've already seen on several examples on the exam. But look, now we have another one of topics. Another propositional phrase there in between our subject and our verb, so let's bracket that off as well, too. And now, we have the range is daunting. And the range covers everything from Plato to plutonium. So that should also be the singular version of the verb. All right. So hopefully you're getting it now. Let's take a look at a test example. The philosophy of organic architecture, with the scope of its meaning mirrored in the developments of Wright's various architectural projects, were consistently present in many of his works and developments. So, we have this phrase, this parenthetical information, set off with commas here. So let's bracket that off. And we also have a prepositional phrase here of organic architecture, so let's bracket that off as well, too. And now we are left with the philosophy as a subject, so the philosophy was consistently present. So we wanna make sure that we still keep that comma after projects and our answer would be C. And this one has a weird extra comma there, so that's not right. And puts a comma between that subject or between the verb and the rest of the sentence, and that's also not right. All right, here is another important tip. It may not be that the test confuses you with a lot of stuff between the subject and the verb, it may actually be that the subject comes after the verb. This is called subject verb inversion. When you see a sentence like this, your ear has no chance of hearing the correct subject before you get to the verb because you haven't even read it yet. So these can be particularly tough. Let's take a look at a test example of this. On the mantle above my grandmother's fireplace lies the collected shells from our evening beach walks. Okay, so what's lying on the mantle? Notice we have these prepositional phrases. All we have above the verb are some prepositional phrases. Where is the subject? The subject is actually after, the shells lie on the mantle, so that is a way that you can help your ear hear what the correct verb should be, is by flipping the sentence yourself. So we can say the shells, or the collected shells from our evening beach walks, lie on the mantle above my grandmother's fireplace, and so our answer would be b in this case. Now d, there's usually going to be two answer choices that have the correct verb, and then something else that is changing on the test. So it should be the collected shells, not the collecting shells, so that would be why d is wrong. Okay, so let's do a quick recap of subject verb agreement. Remember that the subject may not appear immediately in front of the verb. In fact, most of the time when the test is testing subject verb agreement, it's not going to because it would be just too easy. So make sure you bracket off those clauses that appear between it, the prepositional phrases and find the subject. Second, the subject may appear after the verb. So, if you don't see the subject before the sentence, if the sentence seems a little funny, cuz often these inverted sentences do, then make sure you're checking to see if it comes after the verb. Ask yourself the question, what's doing the action? And then hopefully that helps you. And you just flip this up, you flip the sentence around and read it as it would be if the subject came before the verb, and that helps your ear out a lot.